Fashionable for both boys and girls, with a distinct sports/leisure look, these Falke Run and Win Cotton Sneaker Socks, with contrasting cuff bands and toes, have a cool, athletic style. 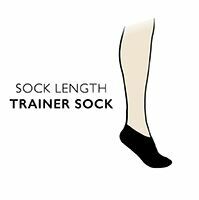 By being made using a skin-friendly and soft cotton rich fibre blend, the socks will feel as cool as they appear. The mesh weave in the uppers provides extra air flow for fresher, healthier skin. Falke Run and Win Cotton Sneaker Socks have supportive ridges in the mid foot, and a higher rear ankle section protects the delicate Achilles tendon area. They have a perfect Falke fit for comfort and feature reinforced stress zones for greater durability during everyday wear.